6 months earlier, we set out with a vision to enable people to reference the enormous (and rapidly growing) wealth of geo specialized information contained in search engines and social networks, quickly and easily, with Localscope on the iPhone. User experience design has been one of our strengths and the iPhone enabled us to create the user experience of the future. Today, we are elated to present Localscope for the TouchPad. Redesigned around the native TouchPad experience, Localscope takes full advantage of the new form factor and the exclusive new capabilities of HP webOS 3.0 including ‘Just Type’ and ‘Exhibition Mode’. Tablet devices are the future of computing. Tablets enable a richer and more immersive experience to interact with information. 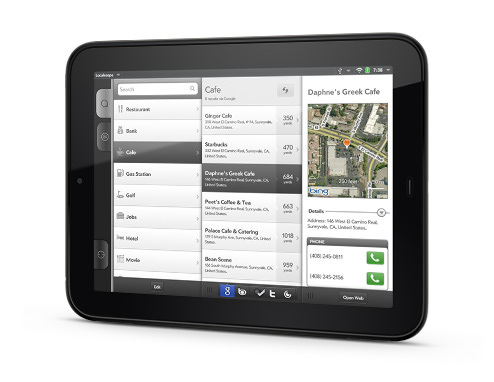 Creating Localscope for the tablet devices has been an obvious step ahead for us. The tablet form factor opens up a lot of great possibilities for expressing information and presenting interactivity. In early days of designing Localscope for the tablet interface, we realized that to take advantage of these possibilities, we needed to re-imagine the Localscope interface from ground up around the tablet paradigm. While our conceptual designs may be platform agnostic, we have always ensured we design our apps tightly around the strengths of the underlying platform. So to start with we chose to create Localscope for a couple of tablet platforms simultaneously. The HP webOS 3.0 platform, though new, allowed for unprecedented rapid development and we think it is one of the most promising and forward looking platforms out there. Many interesting innovations in the webOS 3.0 platform fit well with Localscope. To our surprise, the Sliding Panels metaphor that our navigation design is based upon, is also the predominant metaphor used in most of the advanced interfaces of WebOS. We used webOS 3.0 to our advantage to design Localscope ground up with a completely new interactive and gesture enabled way of using an application, new usage scenarios and use cases & a new interface. Navigating across the app with the gesture driven sliding panels provide an immersive tactile experience for discovering locations. Integration with ‘Just Type’ enables quick search for places in Localscope right from the TouchPad’s home screen. Though the lack of the compass in the API limits functionality a little, we hope HP does something about the compass soon. Gesture driven sliding panels provide an immersive tactile experience for discovering locations and navigating between them. Rich details for each result with an interactive map to pinpoint location and navigate to it. Save a result to contacts for future reference or set it as your current location to further explore the area around it. PCMag and Business Insider, both love Localscope and are recommending it in their list of The 10 Best applications for the TouchPad. We hope you like it too.